I discovered this recipe by accident one night. I was cooking some pork and fennel sausages and had originally been planning an Italian-style dish but the smell of the fennel had such and ‘Asian’ vibe that I just had to change direction. I love when inspiration strikes mid meal! 1. Preheat a wok or frying pan on a medium high heat. 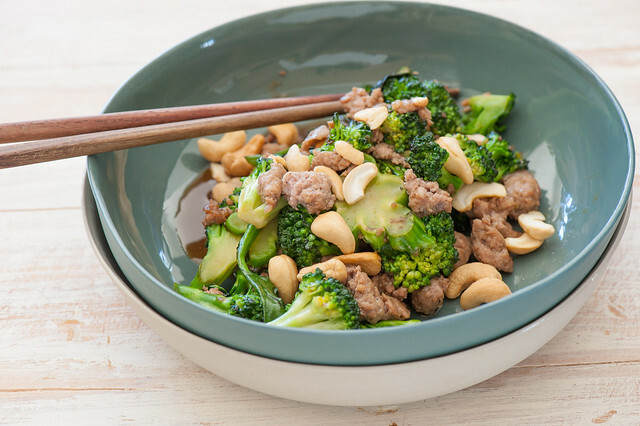 Add broccoli and stir fry until the broccoli is bright green and no longer crunchy. About 5 minutes. 2. Place cooked broccoli in a clean bowl then add a little more oil. Stir fry the sausages until browned and cooked through. 3. Add chilli and return broccoli to the pan. Add oyster sauce and stir fry another minute or until everything is hot. 4. Taste and season with salt and/or more oyster sauce. Serve in bowls with cashews on top (if using). no pork and fennel? – just use plain pork sausages and add 2 teaspoons fennel seeds to the pan. Or a tiny piece of star anise. vegetarian – replace sausages with crumbled tofu or diced eggplant (aubergine). You’ll need to cook the aubergine with a lid on and for much longer – until it is soft about 15-20 minutes. And use vegetarian oyster sauce or soy sauce. no oyster sauce – just use soy sauce or hoisin. more flavour – add a little crushed garlic and/or ginger to the sausages at the end of cooking. different meat – use any stir fry meat such as chopped chicken breast or thigh fillets, sliced steak, pork fillet or peeled green prawns (shrimp). more veg – add in any veg that you like to stir fry such as red capsicum (bell pepper), carrots, zucchini, snow peas, sugar snap peas, frozen peas, even baby corn (if that’s your thing). Or serve with baby spinach, cauliflower ‘rice’, coriander leaves (cilantro) or fresh mint. more substantial – serve with steamed rice or rice noodles cooked according to the packet. Your recipes have changed the way I feed my family and look at cooking! I’m so thankful for you! Looks delicious! Thanks for sharing this recipe, Will have to try this soon! Damn, this recipe looks so delicious! I’m definitely going to try it, maybe the vegetarian option first. Thank you for sharing!